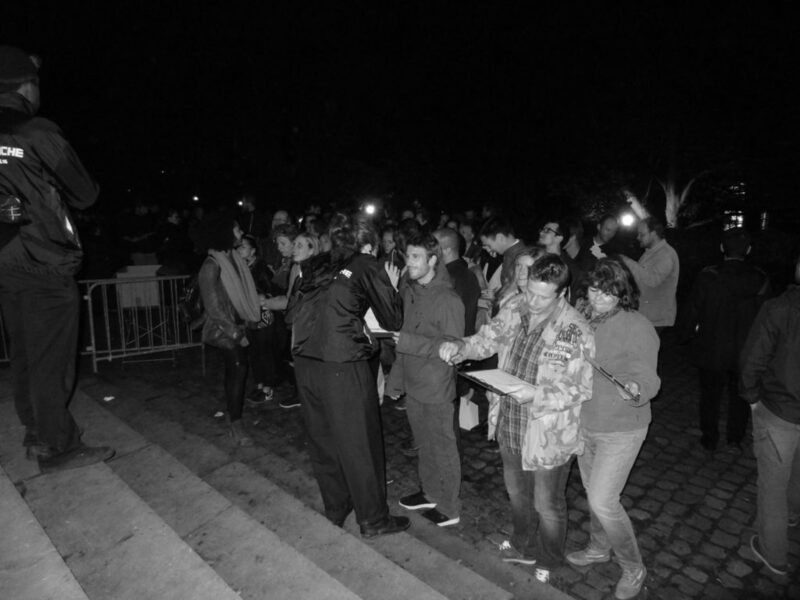 During Nuit Blanche Brussels, CONTAINED – The Extraordinary Queuing Experience let visitors feel, instead of telling them, what arriving in a new place feels like. This hopefully provoked thoughts, sparked discussion and created more empathy for migrants. The CONTAINED team worked with five actors from Brussels. This wider team themselves had very different backgrounds and a diverse experience with migration – from being born and raised in Brussels while being the children of immigrants, to having recently moved to the city from countries both near and far. In three days of rehearsal, we developed a locally grounded performance that represented their experiences as well as wider migration patterns. Using the queue for one of the performances at the Museum of Natural Sciences as a natural stage, we created an immersive theatrical experience. Welcoming visitors to our ‘Extraordinary Queueing Experience’, we told them that the museum was full and that a selection procedure would be put in place to see who would be eligible to enter. But the application form did not make any sense. Some of the instructions were in a made-up language. On top of that, some visitors seemed to be favoured while others were discriminated against, separated from each other or verbally abused. Gradually, the situation became more and more absurd until it reached a climax. That was when we congratulated the audience – they had survived the Extraordinary Queuing Experience. But what if this scenario had been real? This performance treads a line between immersive and invisible theatre, improvised comedy and serious message. Reflections from both the participating actors and the audience revealed that there was a thin line between people’s awareness of being in a performance and experiencing something real. This made it a powerful tool to wake up, confront and constructively frustrate audiences. At the end of the rehearsal process, I had asked the actors what the piece was about. They referred to the piece being a wake-up call about how migrants are treated, as well as a mirror to the absurdity of our system, which cares more about papers than about people, and of which you may not be aware if you are in a more privileged position. 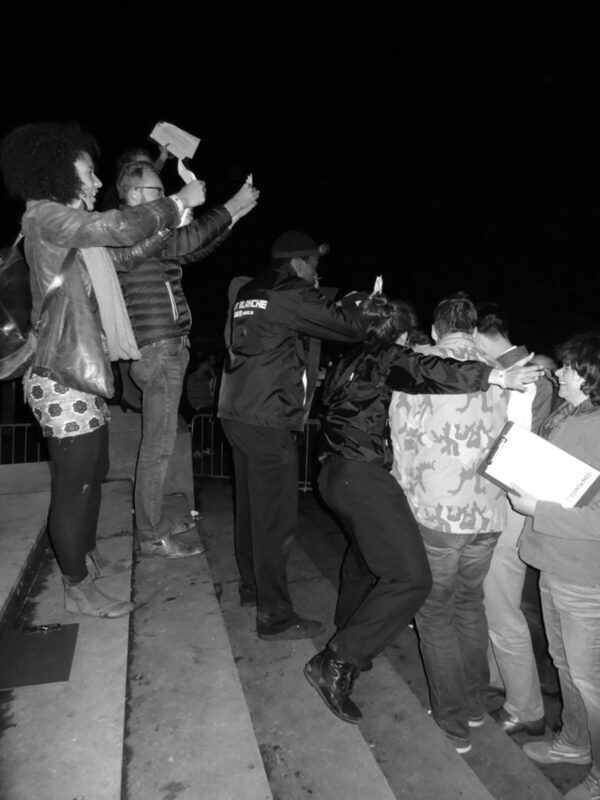 But what if the queueing was not about getting into a cultural event, but about life or death? About being able to take care of your family? About realizing your dreams? What if it went on for months, years, or decades? Indeed, some audience members commented on this analogy even at an early stage of the performance, saying: ‘this may seem funny, but this is actually what Syrian refugees are going through right now’. The actors also expected the piece to confront the level of active citizenship in the audience. If you see injustice happening around you in the queue, will you do something about it? How will you feel about yourself when you find that each of these injustices represent migration issues? Indeed, the crowd turned out to be very responsive to group pressure, while others were personally engaged with the different characters, whether or not they realized they were part of the performance. An audience member said that he found the performance funny, entertaining and clever until the character who had tried to get through the gatekeeper was pushed back into the crowd and into his arms. The fact that he had been there to catch her really touched him. One actor said of the piece: ’You are welcome, but somebody is going to think for you. We are going to play with you. The message is: you are welcome but you have to leave your rights behind’. Even though we made it clear that this was a theatrical performance, this sense of powerlessness over the decision to enter nonetheless had its effect, which raised a sense of real tension among the audience members. Even by keeping this up for only a few minutes, we let people feel real emotions, and then connected them to those of migrants. This real experience and engagement made this performance, according to one of the audience members, the most powerful of everything she had seen that night. After just three days of rehearsal with five local actors and one evening of performance, we were proud to have woken up, confronted, and constructively frustrated at least 500 people. This is a concept that can be adapted and multiplied in many different settings, preferably working with local actors and their experiences. If you would like us to develop and perform the Extraordinary Queueing Experience in your community, please get in touch!